As we head into the holiday season, a time when many of us are giving thanks and looking back on the year, we wanted to take a moment to celebrate how neighbors have used Nextdoor to help each other in times of need. Throughout the year, many of you have shared moving stories about the ways neighbors are helping each other on Nextdoor. From neighbors banding together after the recent floods in Austin, to neighborhoods coordinating garage sales with all proceeds going to charity, it’s clear that Nextdoor has become an essential platform that helps bring neighbors together in times of need. We know there are many more amazing Nextdoor stories from all corners of the country that we have yet to hear of from you. In the spirit of Thanksgiving, we invite you to share how your neighborhood has used Nextdoor to lend a helping hand to your fellow neighbors. Tell us your story in the comments below and you will be entered into a random drawing to win a donation to a local food bank to help others in need during the holidays. We’d love to highlight some of your Nextdoor stories as a way to celebrate neighbors everywhere who go the extra mile to help build stronger and safer communities across the country. Each person who enters a story from their neighborhood will be entered into a random drawing to win a donation from Nextdoor to a food bank of their choice. You must be a verified Nextdoor member to qualify. Photo: Members of Nextdoor Arbor Glen Lane gather for their first-ever block party for Halloween. looking forward to Nextdoor arriving in Australia in 2014. All the best with your success stories, with us entering bush fire and cyclone season here in Australia I’m sure Nextdoor will serve as a very important communication tool and bring a sense of comfort to our neighbourhoods here. Thank you, Anthony. We’re looking forward to bringing Nextdoor to communities in other countries for those very reasons. I don’t have one story… but i have two… that pulled on my heart strings a bit. 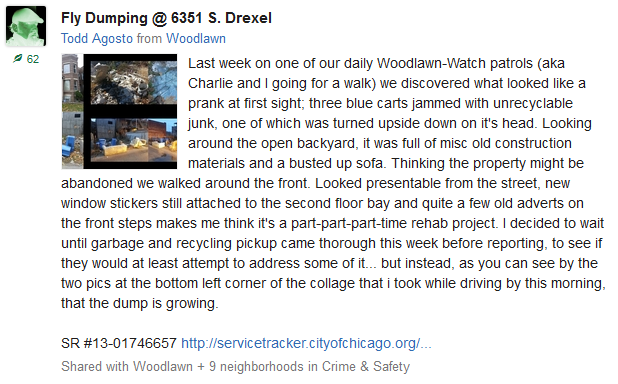 Stories that grew from posts i had hoped would combat some of the blight that plagues our neighborhood. 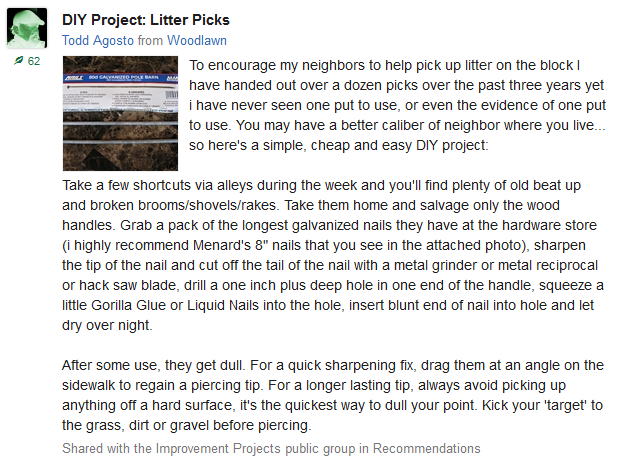 A post i titled ‘DIY Litter Picks’ motivated a neighbor who lives a few blocks from me to reply “Good Idea! I pick up trash on my block and will be sure to try this.” A week or two later i found, by chance, an extra pick in the basement, so i informed him of the fact and he was happy to put it to good use. Since our chat through ND we’ve met face to face and discovered that we are both motivated to keep our blocks clean for some of the same reasons. Especially with the holidays upon us, we both can’t stand having friends and family over with the embarrassment of our streets full of litter. Nice to know i’m not the only one.